This plant was being devoured by dozens of these attractive blister beetles. Above I’ve caught one with a leaf fragment in its mouth. Below, you can see how they’ve stripped a branch clean. The frass seems to be exiting just about as fast as the plant goes in (must be a good source of fiber). 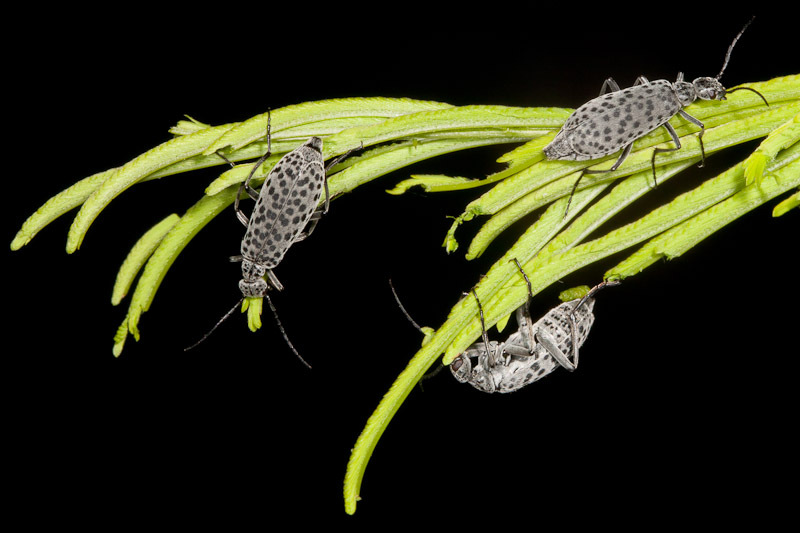 As these pictures show, the plant was literally crawling with these beetles. The dark backgrounds here are an effect of the camera flash. This was actually happening in broad daylight. How are they able to risk doing that? 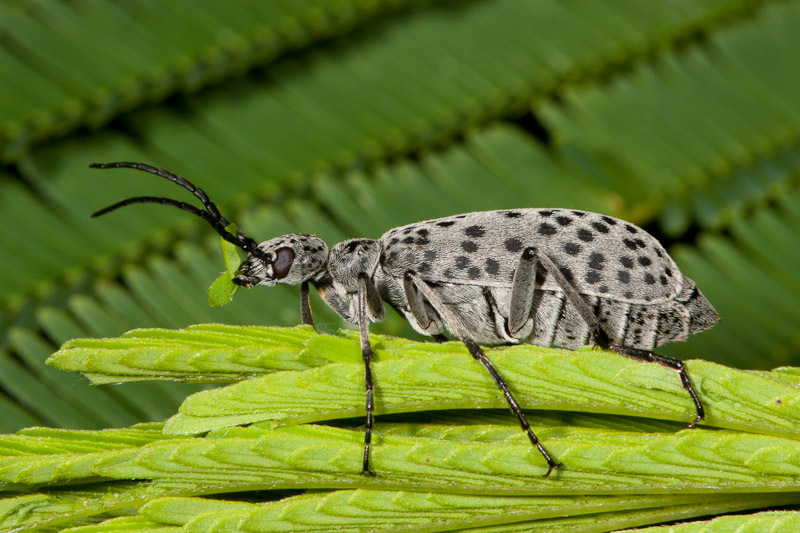 Blister beetles are so named because they defend themselves with a caustic compound, cantharidin, found in their blood. Predators soon learn to avoid them. I found some online pictures of Epicauta species resembling these (example). My web searching also turned up a nice post at Myrmecos, showing the reflexive bleeding. Finally, there’s lots of good info at this University of Florida Featured Creature page. I saw there that Epicauta species are notable for eating leaves, whereas most other blister beetles limit themselves to flowers. That’s more evidence that these might be a species in that genus. Great photos, and it certainly looks Epicauta-ish. 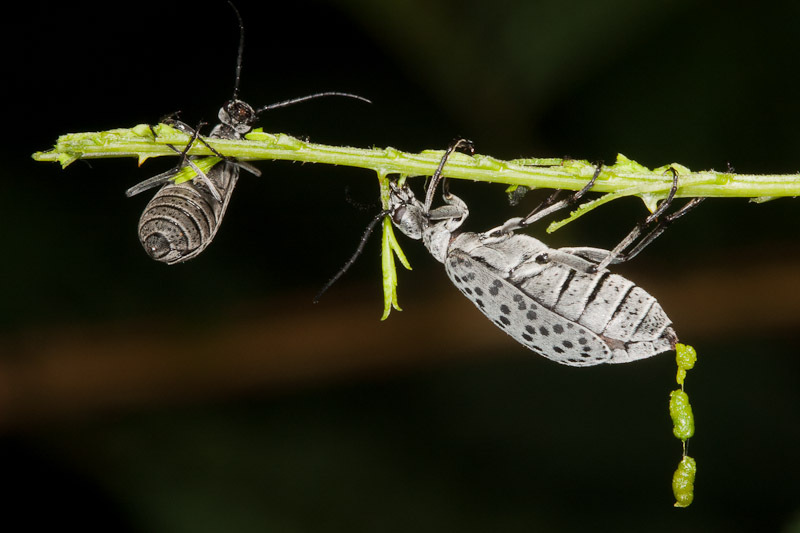 Interestingly, the notes in the link you provide for the Brazilian species says this species (if it is the same) feeds on solanaceous plants – I’m guessing the plant in your photos is something fabaceous.